Throughout January, I'll be reviewing each position's performance for the Dolphins during the 2013 season, noting the good and the bad play and looking ahead at where the position stands for the 2014 season and beyond. 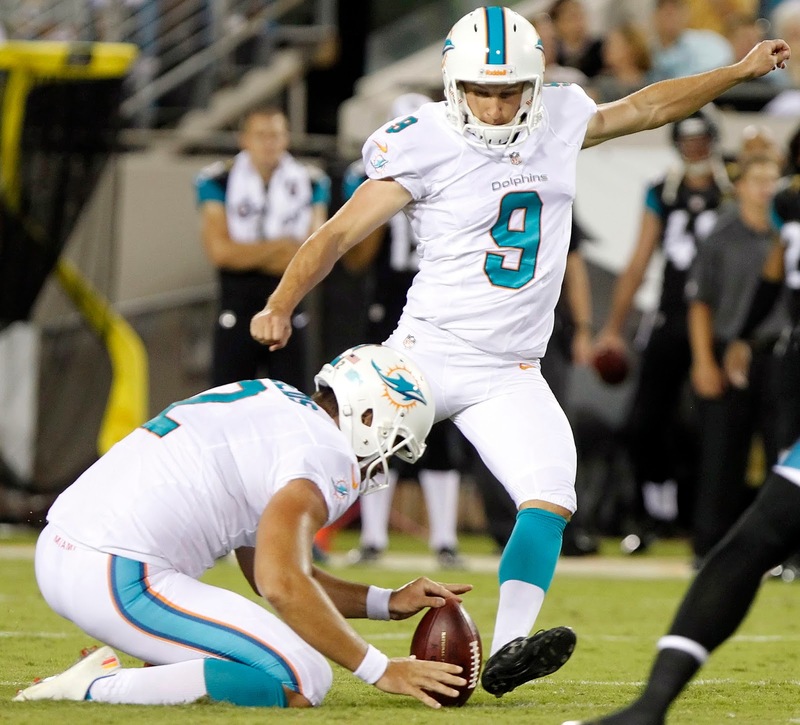 The long-time trio that made up the core of the Dolphins' special teams unit underwent one change in 2013, as the Dolphins opted for the younger and cheaper route at the kicker position. The Dolphins saved nearly $3 million in cap space by releasing Dan Carpenter, replacing him with rookie fifth-round pick Caleb Sturgis. While the decision to get cheaper at kicker isn't necessarily a bad one, the initial returns for the Dolphins did not pay off. Carpenter set a new career high with a 91.7 field goal percentage for the Buffalo Bills, while Sturgis ranked 29th in the NFL at 76.5 percent and 28th in the NFL in attempts of 50+ yards, going 3-for-7. He also ranked right in the middle of the pack in both touchbacks and kickoff return percentage. Continuing the negative trend on special teams is return specialist Marcus Thigpen, who saw a significant drop in production in his second pro season. After returning a kickoff and a punt for touchdowns last season, Thigpen failed to find the end zone was a returner in 2013 while seeing his averages drop off significantly from the previous season. (27.4 to 22.5 on kickoffs and 12.2 to 7.8 on punts.) Beyond the raw numbers, I can also say with certainty that Thigpen at times displayed baffling decision-making when it cames to coming out of the end zone, letting punts bounce and fair-catching others. Things were much better for the Dolphins in the punting game, where Brandon Fields continues to be head and shoulders above most of his NFL counterparts. Fields rightfully earned his first career Pro Bowl selection in 2013 after ranking 1st in the NFL in punt average (48.4), 2nd in punts downed inside the 20 (36) and 1st in the AFC (2nd in NFL) in net average (42.6). For me, the standout on special teams was Marlon Moore, who totaled five tackles and made numerous big plays in 8 games with the team after being cut by the 49ers. Rookies Don Jones and Dion Jordan also showed well on special teams, though you'd certainly prefer your first-round pick to be doing something more than covering kickoffs. The Dolphins are in fine cap shape for the 2014 offseason and Brandon Fields remains one of the true elite punters in the NFL, so I would consider his roster spot safe despite a cap number of nearly $3.6 million. To a lesser extent, John Denney should be save as long snapper at $975,000, but the 35 year old is not above competition from a younger player and potential replacement. The Dolphins invested a fifth-round pick in Sturgis last year and while that alone won't keep him safe, I suspect he's the favorite to maintain the job in 2014. If the Dolphins still have confidence in his ability, the affordably-signed Sturgis should remain in the role for the foreseeable future and may very well not even face training camp competition. Among some of the Dolphins' special-teamers, free agents include Michael Thomas and Jonathan Freeny (exclusive-rights), R. J. Stanford (restricted) and linebacker Austin Spitler and Marlon Moore (both unrestricted). The ERFAs should be back, while Stanford's return is far less certain. Moore, however, would be great to bring back at a reasonable salary, as his lack of upside as a receiver limits his appeal to other clubs but his special teams ability is strong.